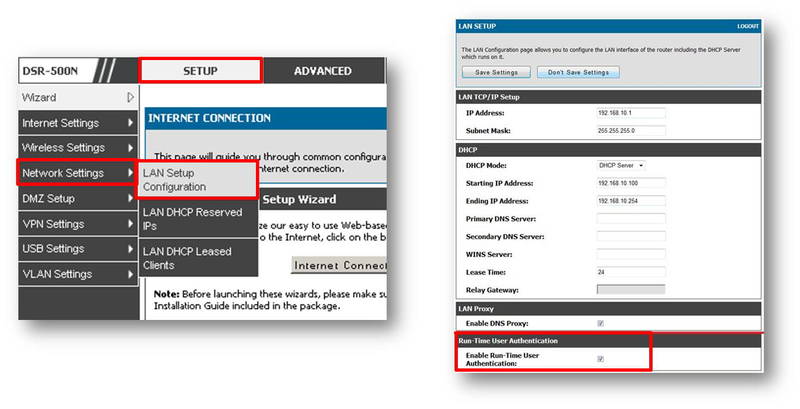 Step 2: Click Network Settings > Lan Setup Configuration. Step 3: Enable Run-Time User Authentication. Step 4: Click Advanced tab. Step 5: Click Users > Users. What is loopback Detection The Loopback Detection function is used to detect the loop created by a specific port while Spanning Tree Protocol (STP) is not enabled in the network, especially when the down link devices are hubs or unmanaged switches. The Switch will automatically shut down the port and sends a log to the administrator. The Loopback Detection port will be unlocked when the Loopback Detection Recover Time times out. The Loopback Detection function can be implemented on a range of ports at a time. Step 1: Open an Internet browser (such as Internet Explorer) and enter http://10.90.90.90 (if the switch has the default IP address) in the address bar, then press Enter. NOTE: If you have changed the IP address, plesae use the assigned IP address instead of the default. 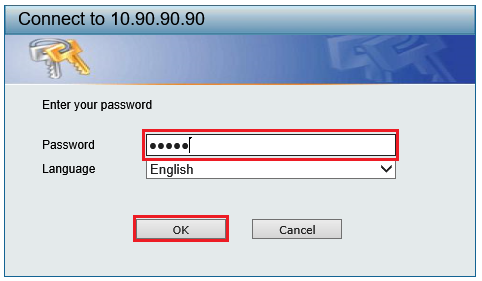 Step 2: Enter the password for your Admin account in the field provided. If you have not changed this password from the default, the password is ”admin”. Click OK. 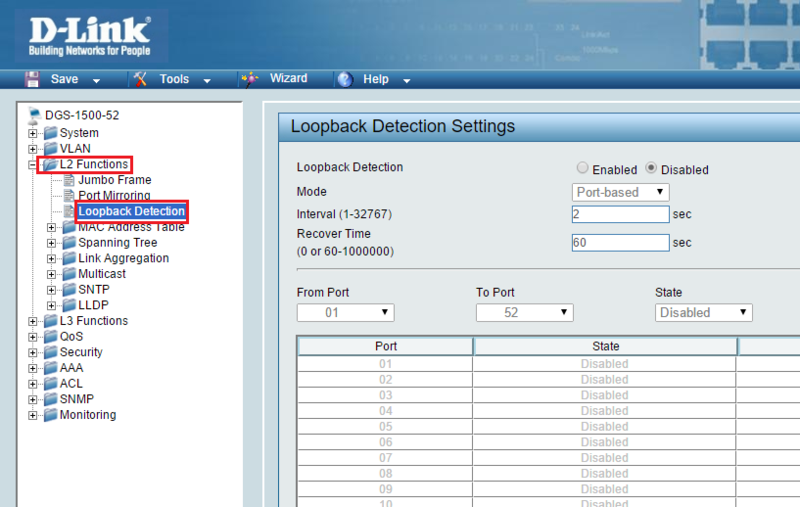 Step 3: Click L2 Functions then select Loopback Detection. 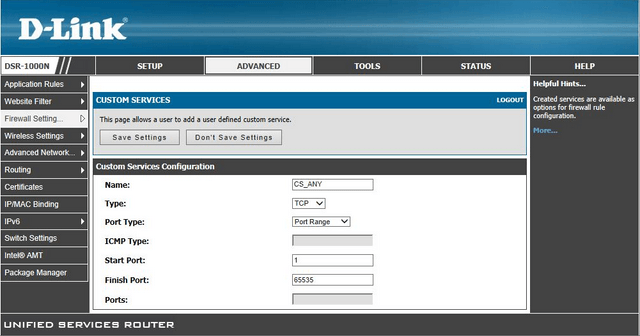 Select the mode, specify Port-based or VLAN-based mode. Set a Loop detection Interval between 1 and 32767 seconds. The default is 2 seconds. Click Apply to save your changes. From Port: The beginning of a consecutive group of ports may be configured starting with the selected port. To Port: The ending of a consecutive group of ports may be configured starting with the selected port. State: Use the drop-down menu to toggle between Enabled and Disabled. The default is disabled. Click Apply to implement changes made or click Refresh to refresh the Loopback Detection table. Step 5: Save the configuration. Click the Save tab, select Save Configuration, then click Save Config. You have successfully enabled the loopback detection for the DGS-1500 switch. What modules and transceivers can I use for the 10G open slots on the DWS-3026 and DWS-4026? The D-Link DWS-3026 and DWS-4026 come with two empty slots for 10G. Module: DEM-410X (1-Slot 10-Gigabit XFP Module). How do I upload new a Boot Prom image and new Firmware while in stack mode Using D-Link DWS Switches? 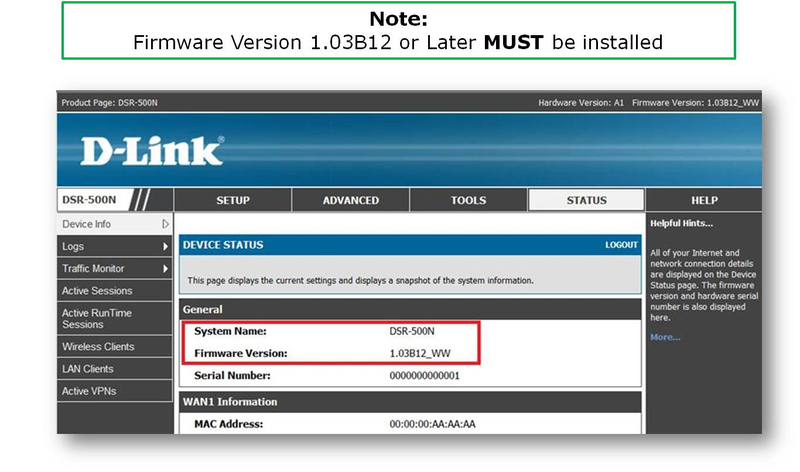 You can upload a new Boot Image and/or new Firmware to your D-Link DWS/DXS-32xx switches in stacking mode all in one attempt. Step 1 Please type the following command to upload the latest boot version. If you are already running the latest boot code please skip this step and upload the firmware. Step 2 Please run the following command to upload the latest firmware. following command for each switch. You need to run this command for every switch of the stack. How to set a bandwidth limit for incoming traffic for all IPs on a specific VLAN? If you want to limit a certain VLAN’s incoming bandwidth usage, for instance to limit a guest VLAN’s download speed. Step 1: Login in to your DSR. Click Advanced in top menu bar. Once the page has refreshed, in the left hand menu, hover over Advanced Network then Traffic Management, then click Bandwidth Profiles. Step 2: If you have not already done so, you will need to tick the “Enable Bandwidth Profiles” tickbox, then click Save Settings. Click Add to create the inbound traffic limit. Step 3: Name the Profile, for instance if you are creating the profile for VLAN 2 inbound traffic, you could name it VLAN2_Inbound. Change the Profile Type to “Rate”. In the Minimum Bandwidth Rate box, type the minimum bandwidth you would like that VLAN to get. This can be set to any value between 1Kbps and the Maximum Bandwidth Rate value. Set the Maximum Bandwidth Rate. This can be any value from 100Kbps to 1000000Kbps. 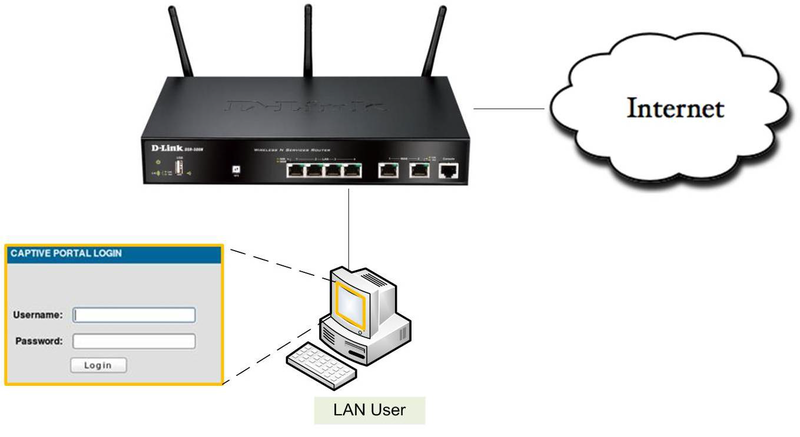 Set the LAN Interface to be the LAN you want to limit bandwidth for. Step 4: Click Save Settings to save this profile. Step 5: You need to define a custom service for use in step 7. 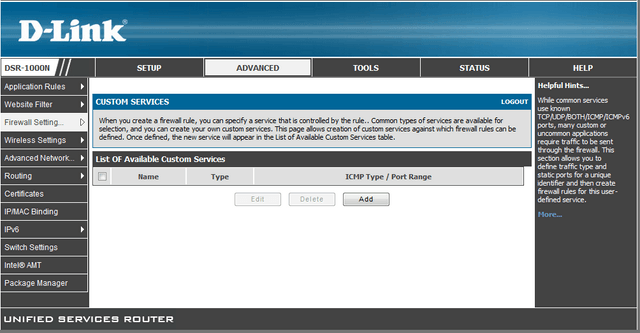 On the left hand menu, hover over Firewall Settings then click Custom Services. Step 6: Click Add. In Name put “CS_ANY”. For Type select “Both”. Leave Port Type as “Port Range”. In Start Port put “1”, in Finish Port put “65535”. Click Save Settings to save this setting. 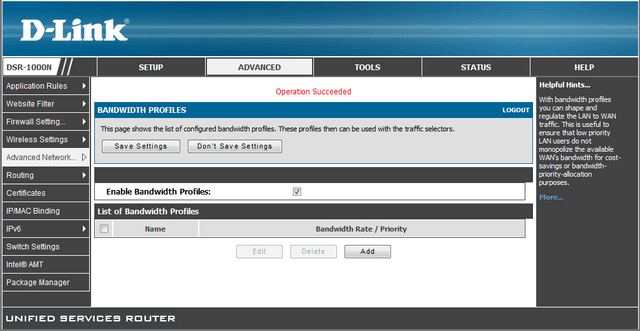 Step 7: In the Available Profiles box, select the Profile we created earlier, in this case “VLAN_250_Inbound”. In theService box, select the service we created in Step 5 “CS_ANY”. 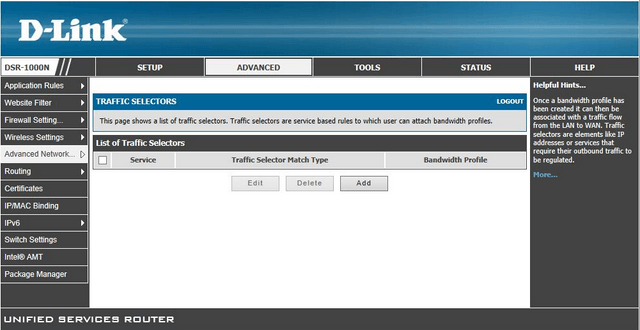 In the Traffic Selector Match Type box, select IP. In the IP Address box type “0.0.0.0”. In the Subnet Mask box, type “255.255.255.0”. 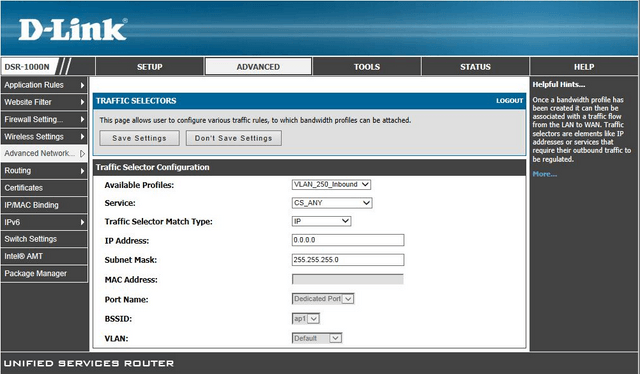 Click Save Settings to save this traffic selector, and limit incoming traffic for all IP addresses on this VLAN.